(Nanowerk Spotlight) Gene transcription – the process by which a sequence of DNA is copied into messenger RNA, which carries out the gene's instructions – is tightly regulated by proteins called transcription factors. These transcription factor (TF) proteins are master regulators of transcriptional activity and gene expression. Transcription factors are responsible for transcribing the correct genes and therefore for producing the right quantity of proteins. TF-based gene regulation is a promising approach for many biological applications, however, several limitations hinder the full potential of TFs. 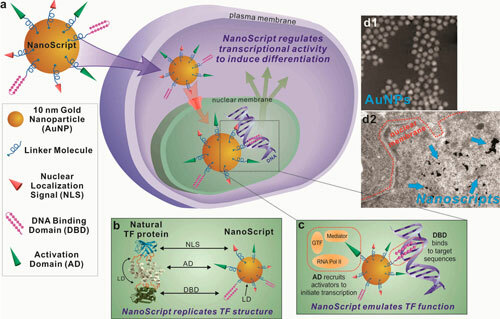 To overcome these problems, an international team of researchers has developed an artificial, nanoparticle-based transcription factor, termed NanoScript, which is designed to mimic the structure and function of TFs. The team of scientists from Kyoto University and Rutgers University, led by KiBum Lee, an Associate Professor in the Department of Chemistry & Chemical Biology at Rutgers, reported their findings in the August 18, 2014 online edition of ACS Nano ("NanoScript: A Nanoparticle-Based Artificial Transcription Factor for Effective Gene Regulation"). "We constructed NanoScript by tethering functional peptides and small molecules called synthetic transcription factors, which mimic the individual TF domains, onto gold nanoparticles," Lee explains to Nanowerk. "We demonstrate that NanoScript localizes within the nucleus and initiates transcription of a reporter plasmid by over 15-fold. Moreover, NanoScript can effectively transcribe targeted genes on endogenous DNA in a non-viral manner." NanoScript is the first nanomaterial-based DNA nanotechnology platform that interacts with endogenous DNA to regulate gene expression at the transcriptional level. There have been other demonstrations of delivering TF proteins using nanoparticles, but the NanoScript platform is completely different. It is not a tool for delivering TF proteins, but rather, NanoScript itself is a TF protein. "Our motivation was to develop a highly robust, efficient nanoparticle-based platform that can regulate gene expression and eventually stem cell differentiation," says Lee. "Because NanoScript is a functional replica of TF proteins and a tunable gene-regulating platform, it has great potential to do exactly that." Delivery of TFs – commonly referred to as protein therapy – involves delivering proteins into cells and holds immense potential for applications focusing on regulating cellular behaviors such as cellular reprogramming and stem cell differentiation. But no matter what approaches were developed for intracellular protein delivery – nanocapsules, electroporation, lipid micelles, nanoparticle-based delivery, and numerous other – it turned out that exogenously delivered proteins, especially TF proteins, have low delivery efficiency, cannot regulate genetic pathways at the transcriptional level, lack cell-specific targeting capabilities, and above all, are extremely vulnerable to degradation by intracellular proteases. NanoScript though, because it is a tunable platform that can overcome these challenges, has great potential for protein therapy applications. NanoScript was synthesized by assembling three essential components on gold nanoparticles. The first is a hairpin polyamide structure (representing the DNA-binding domain), which was chosen because of its high specificity to target DNA sequences and exceptionally high binding affinity that is comparable to naturally occurring DNA-binding proteins. The second component (representing the activation domain) is a synthetic transactivation peptide that was synthesized to resist intracellular degradation and is capable of activating transcriptional activity by recruiting mediators, RNA polymerase II, SAGA, and other proteins to the binding site. The third component (representing the nuclear localization signal domain) is a nuclear localization signal peptide that functions to shuttle NanoScript into the nucleus. "While stem cell therapies appear very promising, there is a critical gap that exists between our current knowledge and the practical application of stem cell therapies," notes Lee. "For instance, most reports involving stem cells resort to using viral vectors, which pose a number of safety concerns including random DNA integration and the formation of cancerous teratomas, thereby limiting widespread clinical application. But because our NanoScript actives genes in a non-viral manner, it would be an attractive alternative platform for gene-regulating applications." He points out that the most advantageous feature of NanoScript is its tunable components, wherein, by simply redesigning the hairpin polyamide (the DNA targeting molecule on NanoScript) sequence, regulatory genes, such as those involved in differentiation, can be targeted. According to the scientists, NanoScript can easily be applied to almost any cellular reprogramming applications and stem cell differentiation. "For example" says Lee, "by modifying NanoScript to target the MyoD gene – responsible for inducing muscle differentiation – NanoScript can induce differentiation of muscle cells. Furthermore, by targeting pluripotent genes or neural-specific genes, we can potentially generate pluripotent cells or neurons." It is important that this type of reprogramming would be non-viral, and hence it is particular attractive for cellular reprogramming applications. Lee concludes that future research directions are almost limitless because of NanoScript's tunable components. "The field of stem cell biology will have another platform to regulate differentiation while the field of nanotechnology is demonstrated for the first time to regulate gene expression at the transcriptional level."